HOW ABOUT A CONDO ON THE WATER IN BEAUTIFUL SAN CARLOS MEXICO ! !This Californian 55 Cockpit Motor Yacht is located in San CarlosMexico and is cruise ready , she is Captain maintained and has beenextensively upgraded with the following !!!! New pumps,switches , batteries,gauges , New canvas and sundeck screens, complete exterior detail with oxidation removed, premiumsealant and polish applied. All exterior wood and window frames have been refinshed . According to the Captain, of 17 years,she is in the " best shapeshe has been in over the last 10 years"The boat is also stocked with extra parts , new tools and saftey equipment . Possible offshore tax advantages by purchasing in Mexico !!! United Yacht Sales New Jersey would love to guide you through a personal showing of this 55' Californian 55 Cockpit Motor Yacht 1987. 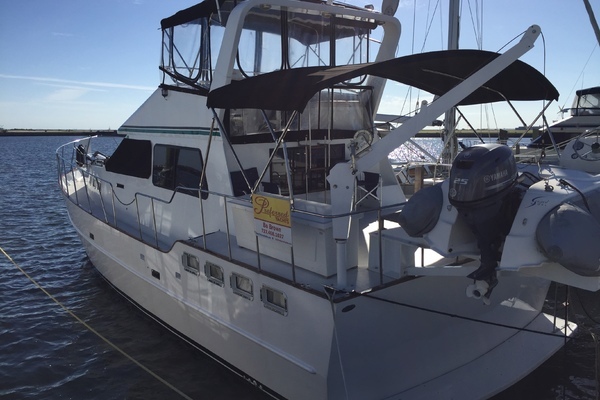 This yacht for sale is located in San Carlos, California and priced at $199,500. For a showing please contact us by filling out the form on this page and we will get back to you shortly! 3 stateroom , 3 headlayout ,down galley,large aft master stateroom w/ ensuite head . Beautiful teak interior ,Very spacious andperfect for aliveaboard.